More than 18,000 people have graduated from CSUMB since the university was founded in 1994. Among their ranks are an Academy Award winner, a teacher of the year, a global wine industry executive, a New York Times journalist, and a lead LinkedIn web developer, just to name a few. Many go on to scientific research careers (some with the help of prestigious National Science Foundation fellowships), others become leaders in community organizing and politics. The pioneering spirit nurtured at CSUMB leads many to start their own businesses in a wide range of fields - from technology firms to restaurants to organic farms. Still more give back to their communities by working in education and nonprofit organizations. Complete the Information Update Form. Petitioned to Graduate? Don't miss GradFest April 3 and April 4! Join us for GradFest! Sign up to keep your email. Purchase GradBoxes and/or Commencement DVD and USB flash drive. Order your cap and gown, announcements, take your senior portrait, and more. 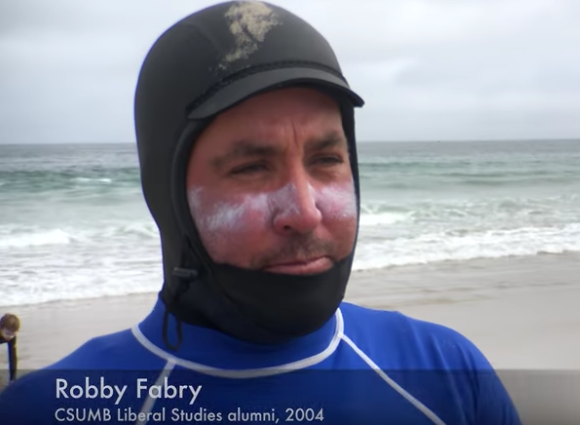 2004 Liberal Studies graduate Robby Fabry is a physical education teacher at the International School of Monterey during the school year but helps run an increasingly popular surf camp during the summer introducing kids from all over the county to the ocean. Watch the Video. CSU Monterey Bay alumna Lisa Fortier was named Rookie Coach of the Year after her first season at the helm at Division I Gonzaga University..Read More. He's energetic, enthusiastic and cheerfully nervy. Those qualities landed Michael Leslie (TAT 2008) internships with the Golden State Warriors, and, eventually, a staff position with the basketball team. Now, he's on the sidelines for the Warriors' run to the NBA championship. Read More.